The K.S. Endeavor jackup drill rig operated for Chevron in shallow water about 5 miles off the coast of the Niger Delta is continuing to burn. This blowout probably won’t be under control until a relief well can be drilled. Chevron confirms the rig had been drilling a gas exploration well they call the Funiwa Deep-A, with a planned depth of 16,500 feet. But the well had only reached a depth of 12,945′ when the blowout occurred early Monday morning. That’s comparable to the depth of BP’s Macondo well that blew out in the Gulf of Mexico in 2010, launching what would become the world’s worst accidental oil spill. The Funiwa field has both oil and gas reservoirs. A big question on everyone’s mind: Could this lead to a major oil spill? Is there a lot of oil already coming out of the well right now, fueling this blowtorch of a fire? Some have reported sighting slicks and sheen in the vicinity. 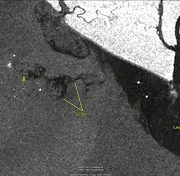 Detail from Envisat ASAR image taken January 20, 2012 showing small slicks in vicinity of burning K.S. Endeavor drill rig. Inferred location of rig shown. Large dark patches along the coast are probably caused by turbid river water entering the ocean. Image courtesy European Space Agency. MODIS/Aqua satellite image (7-2-1 infrared composite), showing location of burning rig (red spot) and plume of smoke on January 19, 2012. Here’s the same image shown in true color. 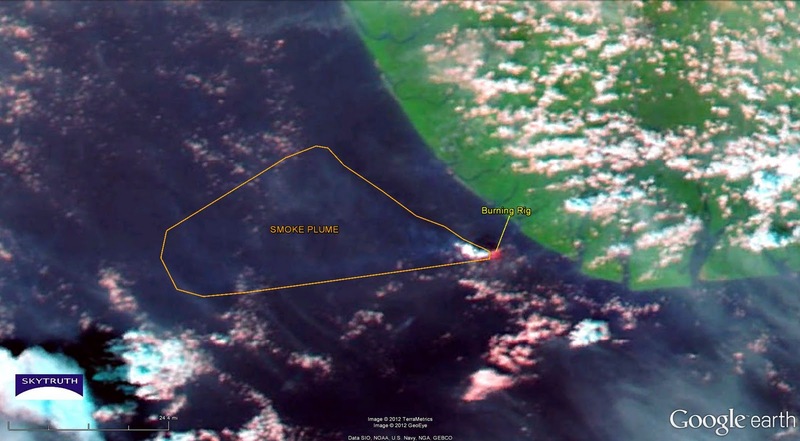 The visible wavelengths are best for seeing the smoke plume, which is about 50 miles long, blowing to the west away from land. The smoke is very white, suggesting fairly clean combustion that you might expect from gas and gas condensate with little crude oil. MODIS/Aqua satellite image (true-color composite), showing plume of smoke on January 19, 2012 from burning K.S. Endeavor drill rig. Compare this with the MODIS true color images from Aqua and Terra showing the smoke plume from the burning Deepwater Horizon rig in the Gulf on April 21, 2010; it’s longer and more persistent, and is obviously brownish in color — possibly because of cooler, less complete combustion due to the high crude-oil content of the BP blowout. If this does indeed mean there is little crude oil coming from the failed Funiwa Deep-A well then we may not see a major oil spill. But until the well is under control, there is always the risk that the situation could change; this deep well probably penetrated several shallower gas- and oil-bearing zones that might come into play if the well’s casing string becomes compromised by the violent expulsion of gas and condensate under high pressure. By the way, the Funiwa field has some sad history: back in 1980 the Funiwa-5 well blew out, spewing some 8.4 million gallons of oil into the Atlantic Ocean here and entering the hall of infamy as one of the largest accidental oil spills ever. Human intervention didn’t stop that spill; eventually the well collapsed on itself (“bridged over”), shutting off the flow. This guest comment was emailed to me yesterday (1/22/2012) by Kurt Glaubitz, and is published here with his permission. Mr. Glaubitz is the Upstream Media Relations Team Lead for Chevron. There is no oil spilled as a result of this incident. This is a natural gas well. The incident occurred six miles (10 kilometers) off shore on Monday, Jan. 16. A sheen on the surface of the water that was visible following incident has been dispersed. We estimated the sheen at approximately 13 barrels in size as of January 17, 2012. It was no longer visible as of January 20, 2012. No chemical dispersants were used. During the period the sheen was visible, the sheen was generally moving away from the shore. We analyzed the sheen to determine it was composed largely of diesel fuel, likely from the rig, and drilling mud. Thanks for this information Kurt. It conforms with what we've seen on the satellite images so far ("reason for optimism"). 1) Does the well produce liquid gas condensate? That is not uncommon for natural gas wells. 2) Does the well produce crude oil? Many gas wells produce relatively small amounts of crude oil in addition to natural gas liquids. 3) Had the Funiwa Deep-A well penetrated any oil-bearing horizons before the blowout occurred? The Funiwa Field is well known for oil production from shallower formations: the blowout of Texaco's Funiwa No.5 well in 1980 spilled an estimated 8.4 million gallons before it bridged over, making it one of the worst accidental oil spills in history (http://www.incidentnews.gov/incident/6256). 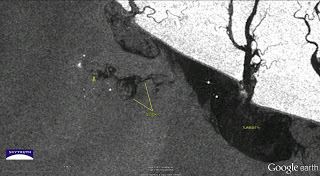 The Envisat ASAR radar satellite image above that shows small slicks (dark patches) in the vicinity of the burning rig was taken at 9:31 am UTC – 10:31 am local time – on January 20, 2012.